the oud is a difficult instrument to play. 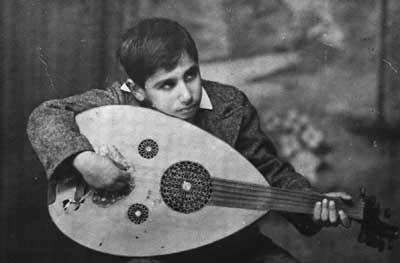 after taking several oud lessons last year it dawned on me that for sub-par western guitar players the oud's mere shape is cause of concern (never mind the lack of physical frets), its bulky round body forbidding any comfortable playing position. unfortunately, like the arabic alphabet, the oud's shape and form are only the first real obstacles to playing the instrument. what follows is a maze of rhythms, patterns and cultural lyrical and musical references that i failed to get a grip on. understandably, i did not persevere. iraqi-born oud maestro munir bachir did persevere. in fact, he brilliantly mastered the oud to the point of apparent time and space transcendence. bachir's skills are perfectly conserved in the following live recording in Geneve, Switzerland. the whole album is pure oud in all its solo glory and all tracks are mind-blowing; nonetheless, i've got special love for bachir's cover of asturias (aka spanish caravan by the doors). highly recommended. find the whole album here, it's owed - as so many other great finds - to ghostcapital.